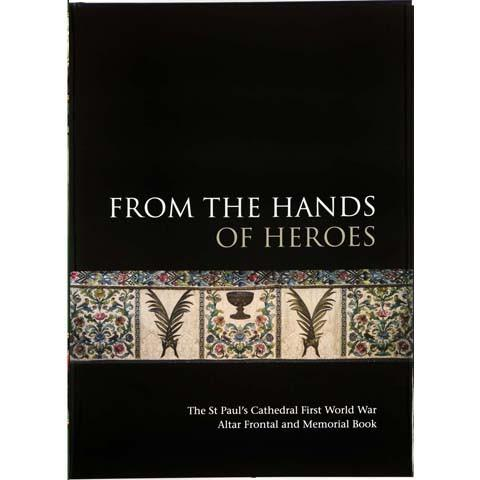 From the Hands of Heroes - a full colour hard-back book that reproduces the original altar frontal and every hand-crafted page of its accompanying memorial book. During the First World War, convalescing servicemen in Britain’s military hospitals were aided in their recovery by a remarkable kind of therapy: embroidery. Some of these war-hardened men worked on a project for the altar of Sir Christopher Wren’s masterpiece, St Paul’s Cathedral. The quiet splendour of what these men produced – and the story of its creation – is presented, explored and honoured in ‘From The Hands of Heroes’ - a full-colour, 92-page, hardcover book that reproduces the original altar frontal and every hand-crafted page of its accompanying memorial book. It allows us a century later to marvel at the contrast between the colour and vibrancy of what these men produced and the deathly mud-soaked landscape in which they lived and fought. The abiding message is one of how hope can overcome despair and beauty can mitigate tragedy. It is a tribute to the skill and resilience of a group of damaged men who found solace and meaning in the making of a unique memorial.